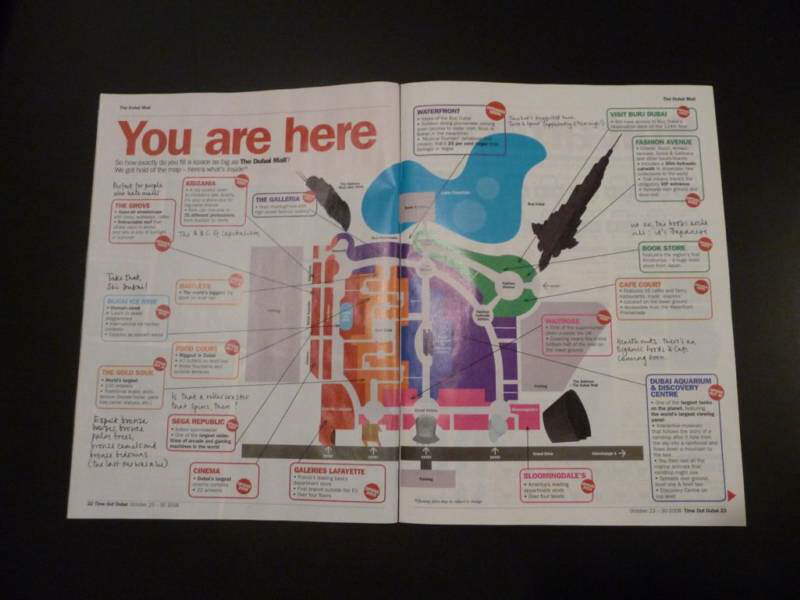 It is 4 times as many as the new Westfield London shopping centre. 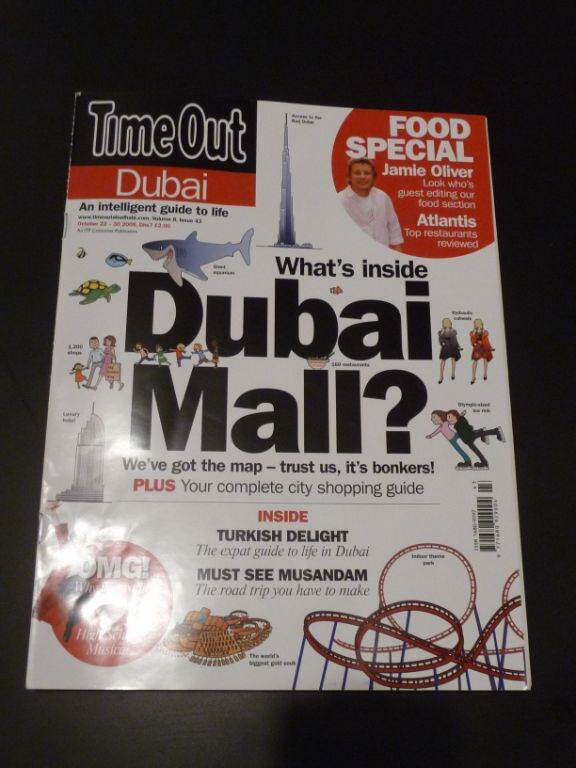 Twice delayed, Dubai Mall opened on November 4, 2008, with about 600 retailers, marking the world's largest-ever mall opening in retail history. 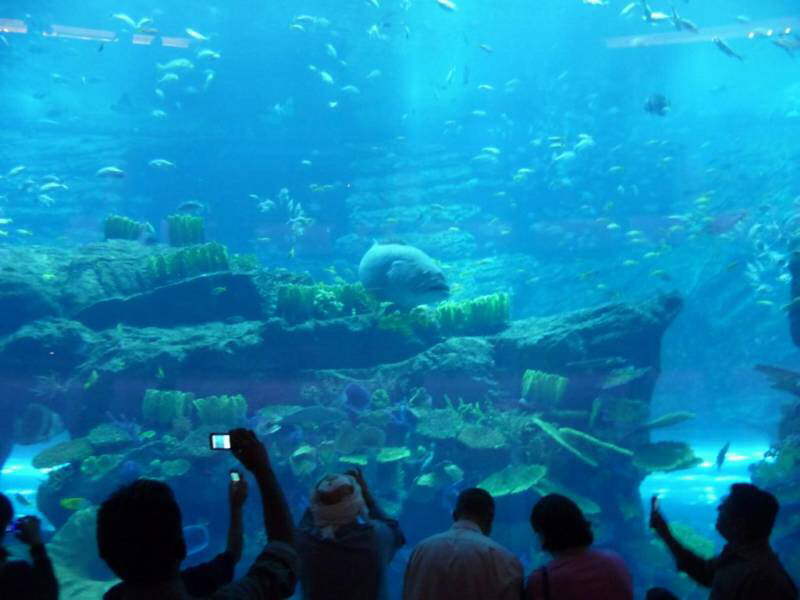 However it is not the largest in gross leaseable space, and is surpassed in that category by several malls including the South China Mall, Golden Resources Mall, SM City North Edsa, and SM Mall of Asia. 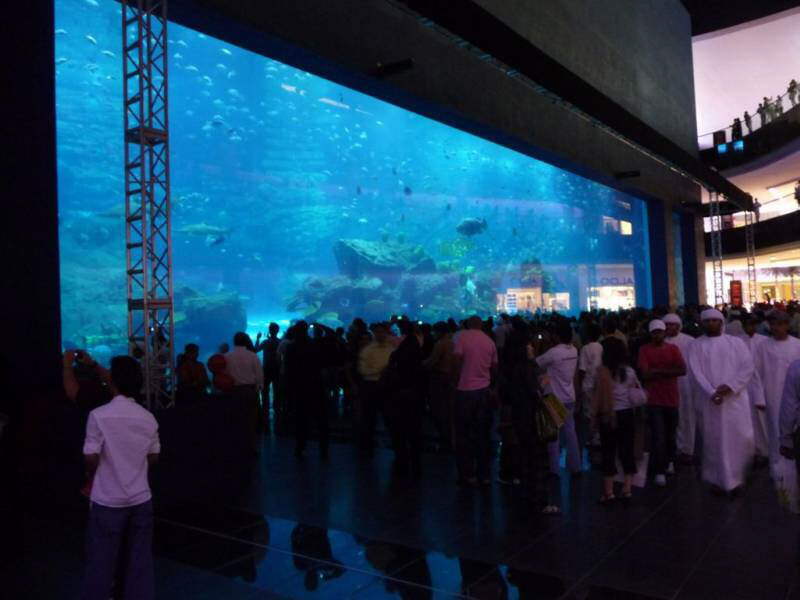 Over 12 million sq ft (equivalent in size to more than 50 soccer pitches), the Dubai Mall has a total internal floor area of 5.9 million square feet (55 ha) and leasable space of 3.77 million square feet (35 ha), about same as West Edmonton Mall. 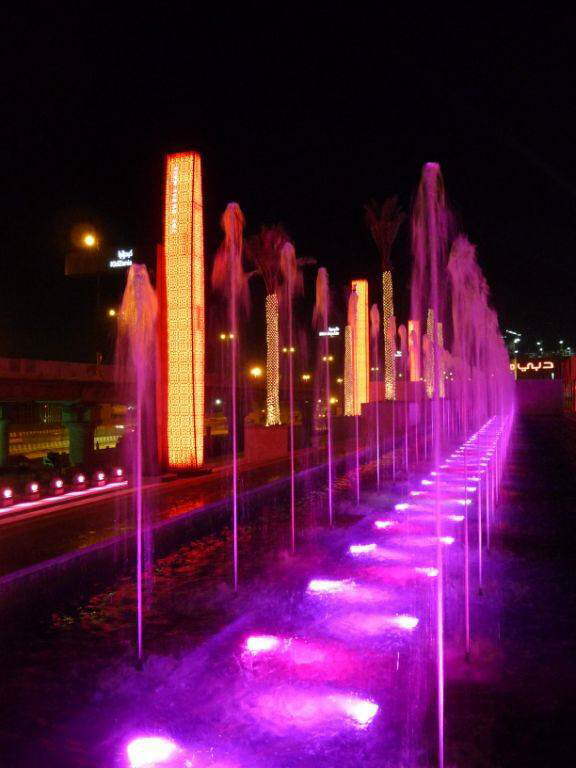 It surpasses the previously largest mall in the Middle East City Stars, which is located in Cairo, Egypt. 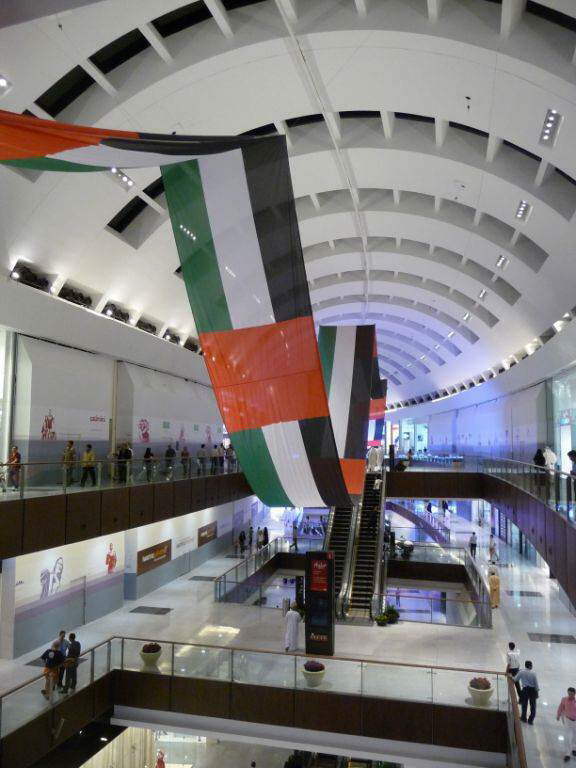 With a gross area of over 8 million sq feet (74 ha), City Stars was the largest mall in the Middle East since 2003. 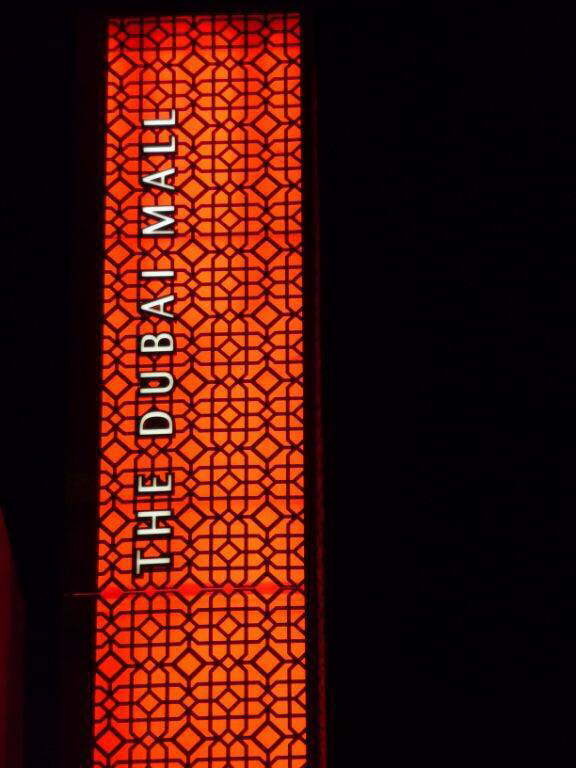 The Dubai Mall has 10-15 distinct 'malls-within- a-mall', totaling 9 million ft² (84 ha) of shopping retail space (comprising of a total of 1200 stores, when fully operational) . 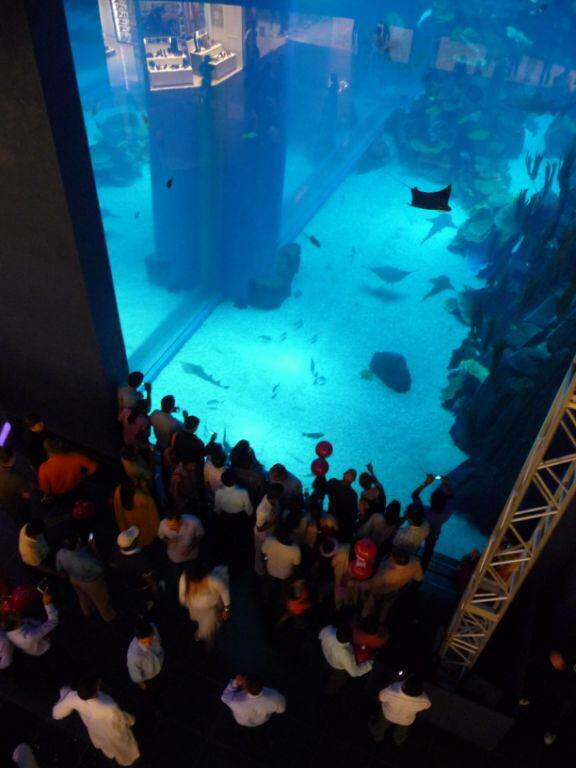 Featured attractions include: the world's largest Gold Souk with 220 retailers; the 850,000 sq ft (79,000 m2) Fashion Catwalk atrium; Fashion Island (Avenue), with 70 stores dedicated to haute couture; the Middle East's first Galeries Lafayette department store; Oasis Fountain Waterfall; and WaterFront Atrium. 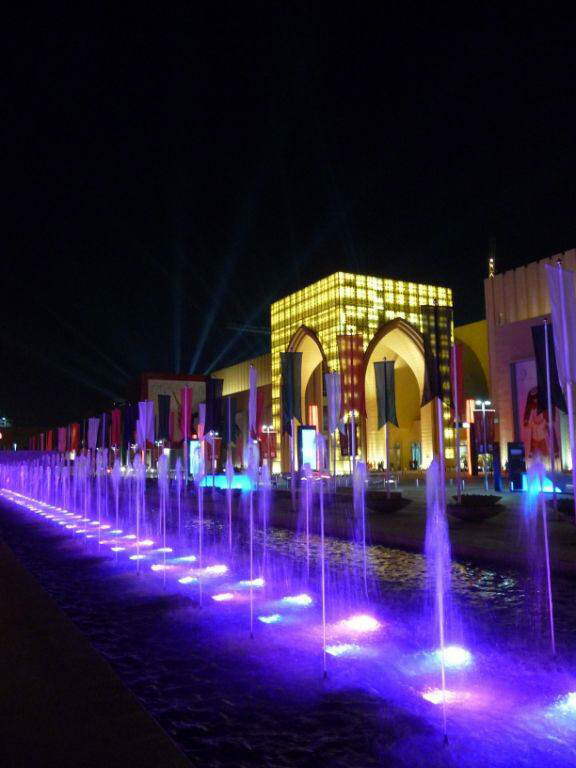 Other attractions include the region's first SEGA indoor theme park covering 76,000 sq ft (7,100 m2); KidZania, a 80,000 sq ft (7,400 m2) children's 'edu-tainment' centre; a 22-screen Cineplex, the largest in Dubai; and The Grove, an indoor-outdoor streetscape with fully retractable roof. 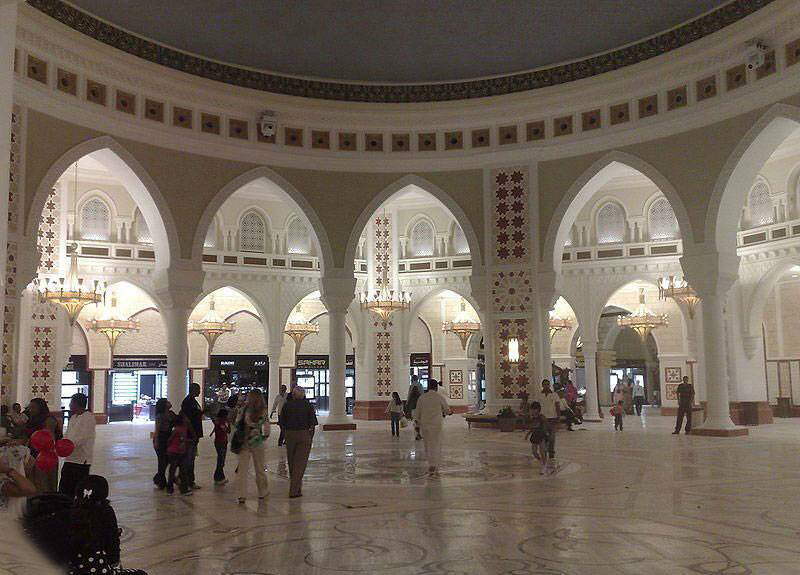 It also features over 160 food and beverage options, 220 gold & jewelry outlets; a supermarket and an organic food mart. 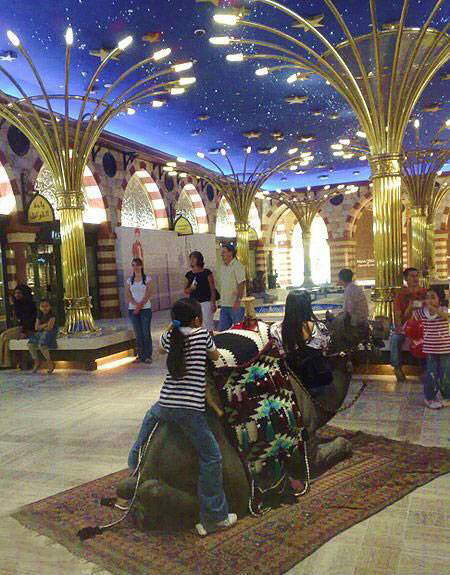 Among the shops is British toy store Hamley's, which opened a 32,000-square foot (3,000 m²) store that includes a replica of London's Regent Street, with the franchise owned by Retail Arabia. Many shops, however, remained shuttered for a long while to come. 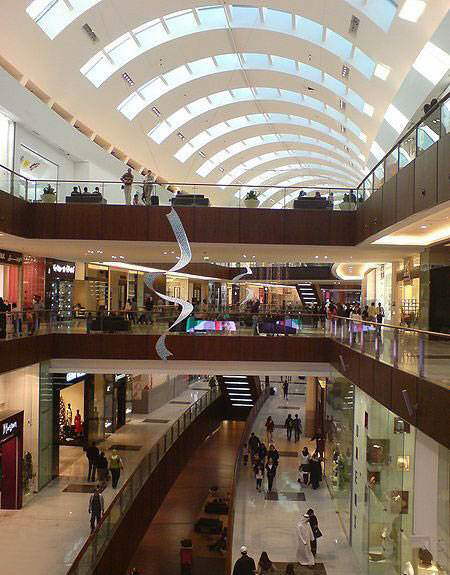 Bloomingdales might open by 2010 and Galeries Lafayette, by February, 2009. 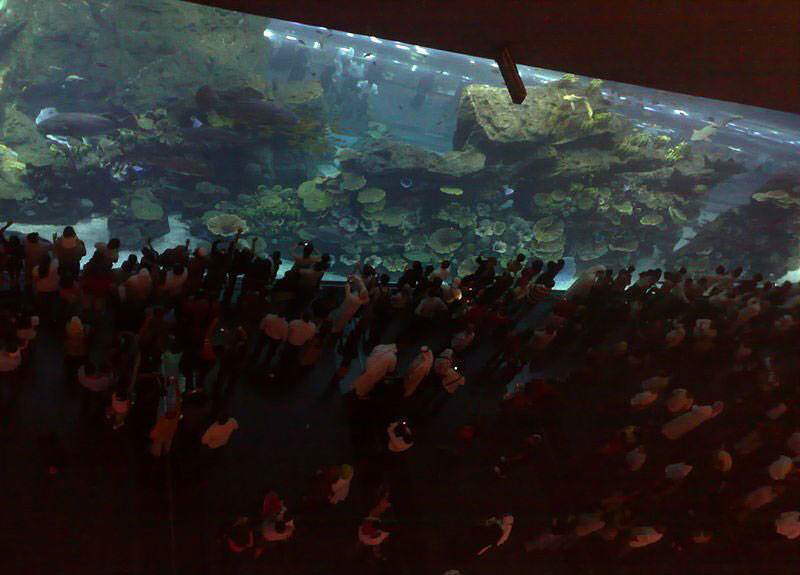 It also has a 250-room luxury hotel, 22 cinema screens plus 120 restaurants and cafes. 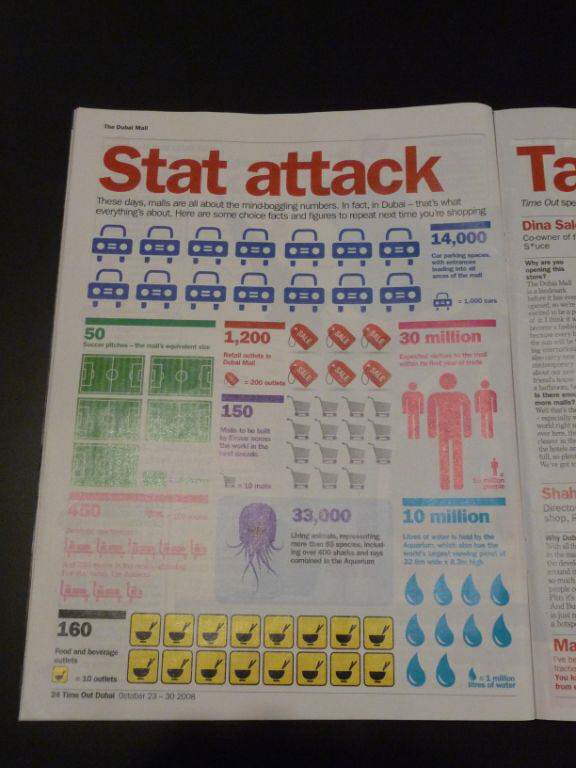 The Mall has over 14,000 parking spaces across 3 car parks, with valet services and a car locator ticketing system. 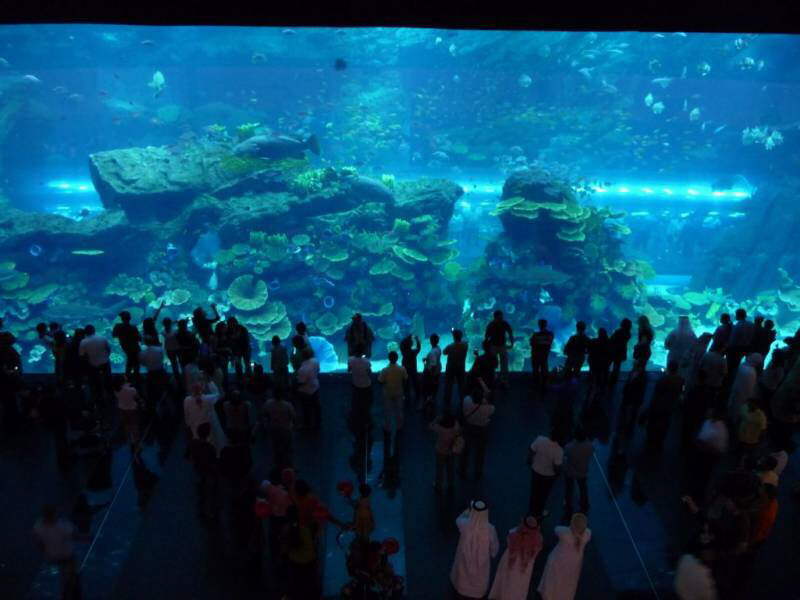 The Mall's Dubai Aquarium and Discovery Centre, developed and operated by Oceanis Australia Group, officially earned the Guinness World Record for the world's "Largest Acrylic Panel" (32.88 m wide × 8.3 m high × 750 mm thick and weighing 245,614 kg). 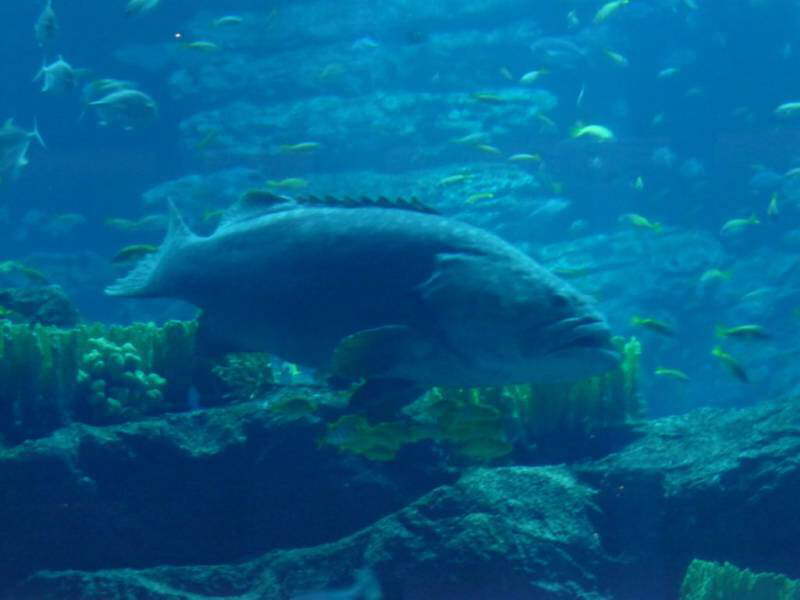 The acrylic viewing panel is larger than Japan's Okinawa Churaumi Aquarium (22.5 m wide × 8.2 m high and 600 mm thick). 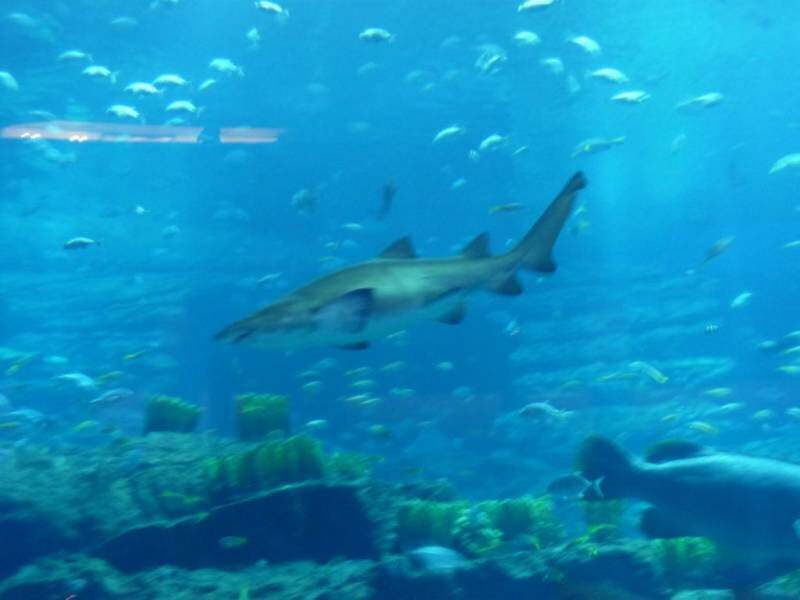 Its 750 mm thick acrylic viewing panel can withstand pressure of 10 million litres of water used in the aquarium, but its transparency gives visitors clear views of over 33,000 marine animals on display. 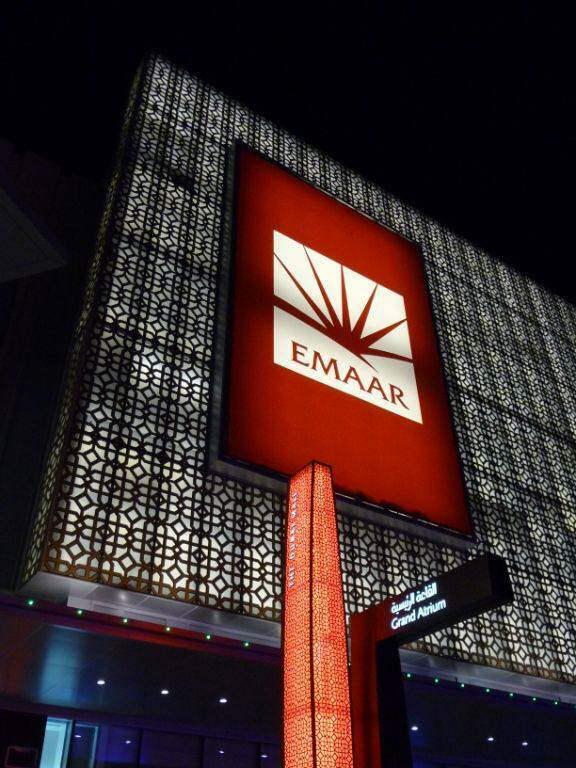 The Mall adopted an International Standard of Ethics and Animal Welfare Policy in its development and operation. 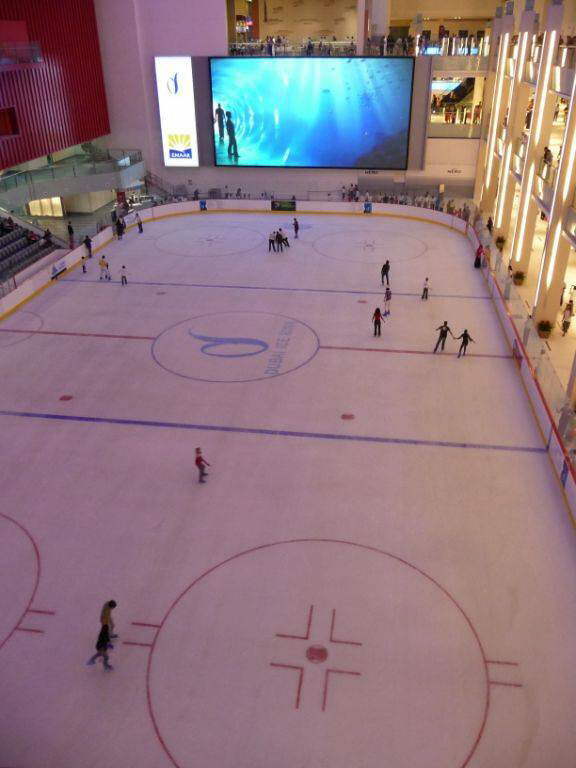 The Mall's Dubai Ice Rink multi-purpose venue, uses refrigeration plant technology by developing 1.5 inches (38 mm) of ice bed, almost 3 times the thickness of an NHL ice rink for Olympic-sized attraction. 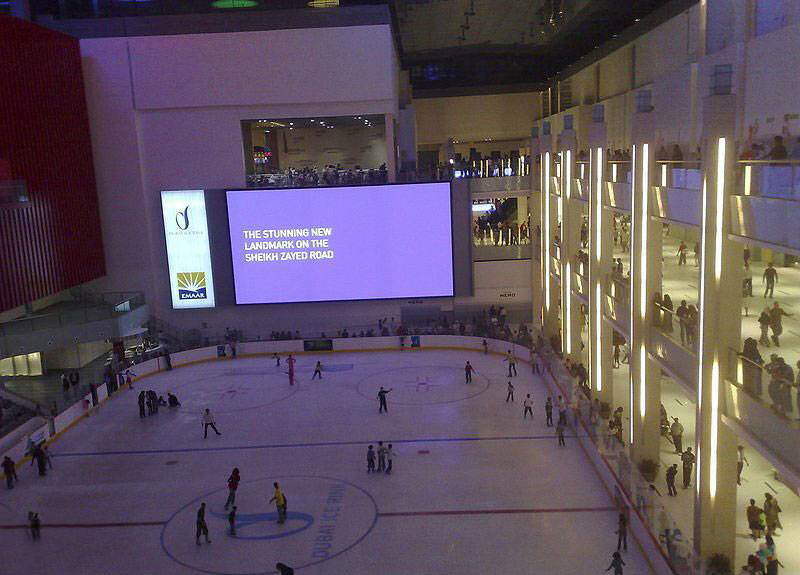 Dubai Ice Rink can host a capacity of up to 2,000 guests, when converted into a multi-functional hall with world-class multimedia system including a 20 m × 10 m LED screen. 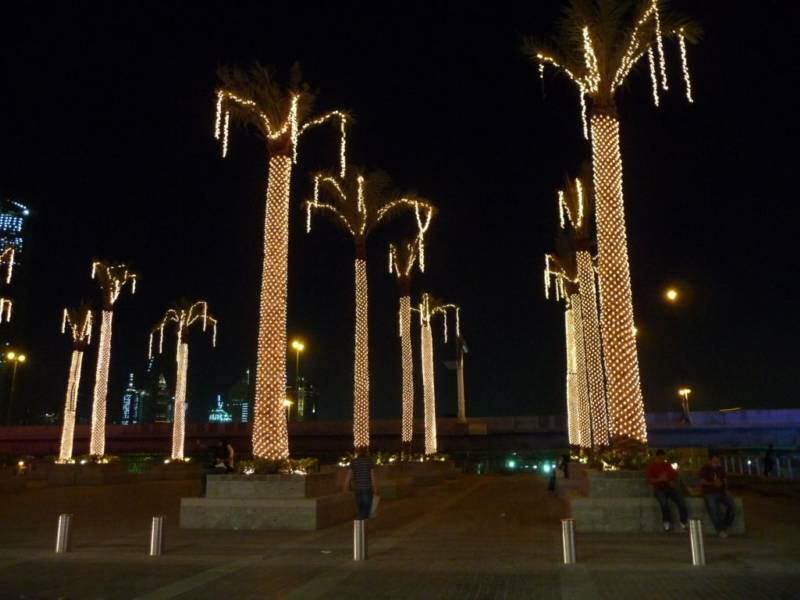 Operations Manager, Richard Rowlands, a 7 years Welsh figure skating pairs, described it: "Dubai Ice Rink in itself is an exciting facility, bringing the first-ever Olympic-sized ice rink to Dubai. 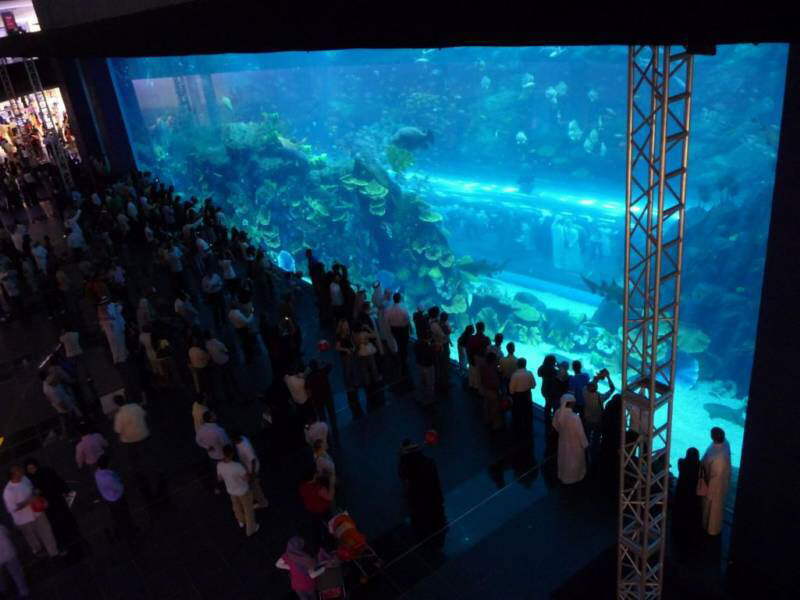 A top-class facility offering the best of, including over 1,800 pairs of skates imported from a leading manufacturer in Italy to fit children and adults of all ages and sizes, the Dubai Ice Rink will host themed nights, Learn-to-Skate programmes, figure skating lessons and hockey matches.The advanced technology used at the Dubai Ice Rink ensures that the consistency of the ice-bed is maintained at all times. By incorporating the refrigerator technology of pushing in glycol through a network of pipes, and monitoring the cooling over a period of five to six days, the 38 mm ice-bed is tailored to withstand multiple activities in a safe environment." 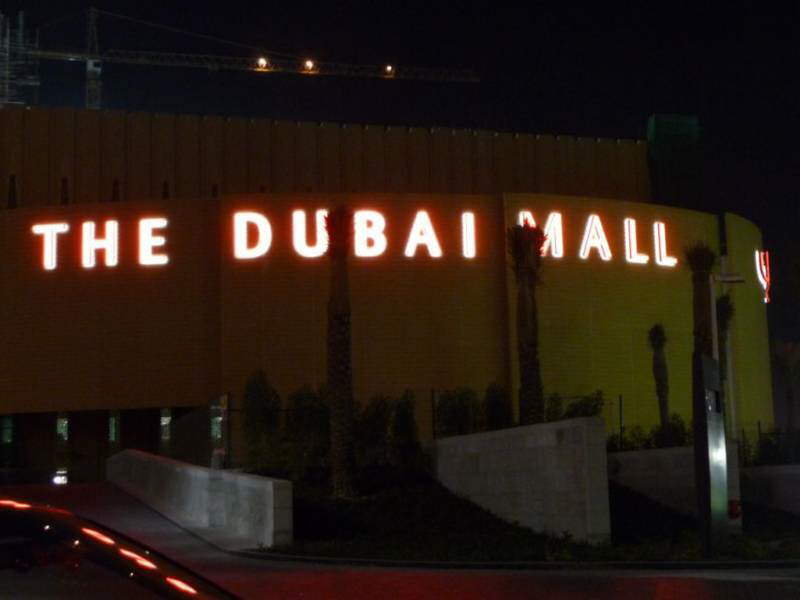 The mall was built by a joint venture of Dutco Balfour Beatty, Al Ghandi/CCC[ and Turner Construction[ citation needed] for Emaar Properties and was scheduled to be completed in 2006, claiming to be the size of 50 "international- sized football (soccer) pitches". 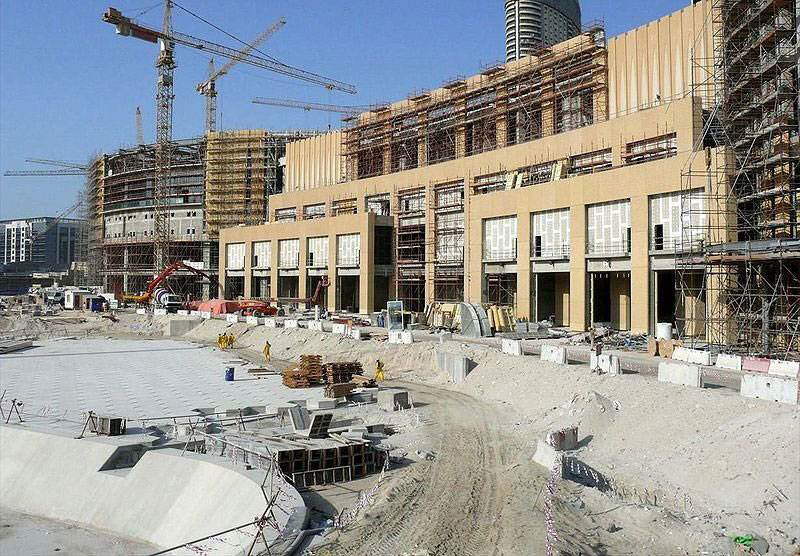 Most of the workers used in construction of the mall were Indian, Pakistani, Bangladeshi & Sri Lankan guest workers. 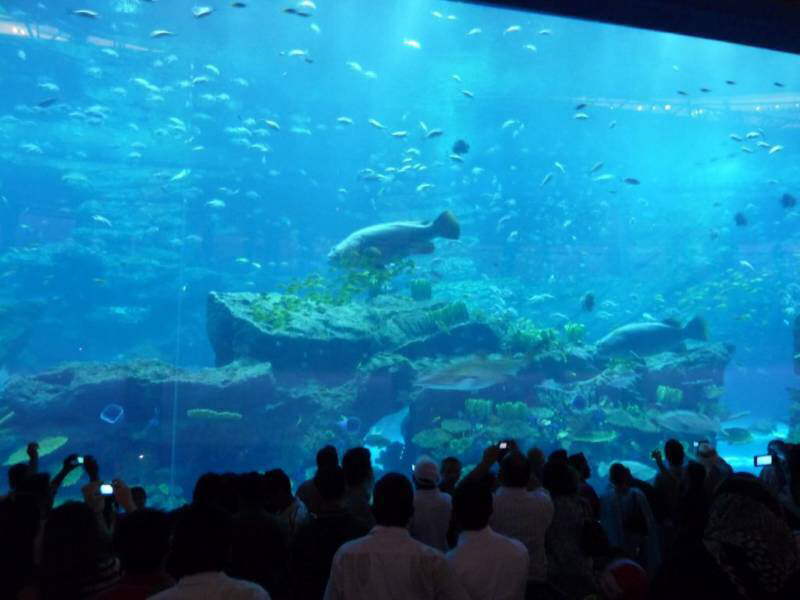 The internal mobile phone coverage for Dubai Mall was commissioned, integrated and carried out by Motorola Dubai for Etisalat & DU. 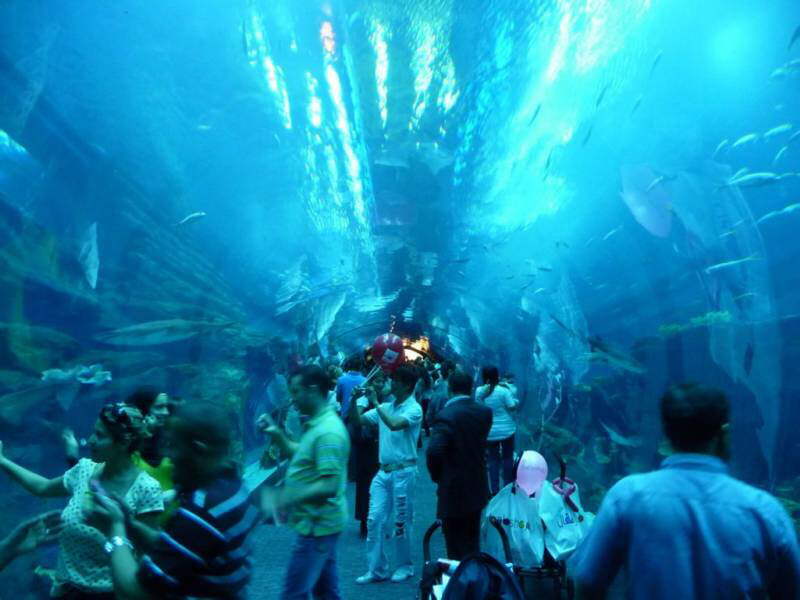 The Dubai Mall contains more than 1,200 shops and is anchored by Galeries Lafayette, Debenhams, Bloomingdale's, and Marks & Spencer.